gobbler83 wrote: I found one saturday. But im affraid its gonna be tricky setting up on him. I was gonna go back in the morning before daylight and try to get close enough to see how he flies down. Should i do this? Season opens next tuesday. I got him to gobble 3 times. He was still on the roosting all 3 times he goobled. The first 2 he was a long way off. I changed location the 3rd time i called. And he was alot closer. So im pretty sure im in the general location. But hes on top of ridge. And i know he will be able to see me easily. I was using a owl hooter. And i was in the woods before daybreak. It was dark. Thanks for the help. Yes, you should go back if you can get in there in the dark and get close without him possibly seeing you. If you're not certain, stay a safe distance away from the roosting area and see if he sounds off in the same location again. If you hear him, just try to listen and see if you can tell what he does when he flies down. See if you can hear (or see) hens with him. If he/they move off away from the roost site,...which they generally will at some point,....go take a look and see if you can tell where they were roosting,...look for piles of turkey droppings under one or more trees in the area. Once you have a good idea of where he was, look around in the direction he/they flew down and left the area. Take note of any small openings or clearings near the roost that they might have flown down into. If there is an obvious location that would be an easy spot for them to fly out of the tree, that is a good spot to start with a first-morning set-up. Take note of tracks, droppings, and especially wing drag marks in the area that would be an indicator of where the gobbler is strutting after he leaves the tree. If you plan on using decoys, note where you might set them up quickly and without a lot of fuss and noise. Look around there and see if you can find a spot that you can get to in the early-morning darkness and set up where you have a good view of the likely fly-down area. You might even clear an area against a tree and place some brush in front of it to create a natural blind,...doesn't need to be a lot, just enough to break up your outline when you are sitting there. Avoid choosing a set-up location that will be in the sunlight once it rises,...choose a spot instead that will remain in the shade so that you will not be highlighted once the sun comes up. Then take note of how you could approach the roost area with the least likely chance of being busted or spooking any of the birds. Take some time to establish how you will get in there when it is dark. This pre-season preparation will be of great value to your success. On opening morning, get in there real early before any hint of daylight and set up. If you are going to use a decoy or two, quickly set them up. Don't worry about any kind of calling. Just sit and let him start up. If he is where you thought he would be, just wait him out (if he is not in the spot you thought and is quite a ways off when he gobbles the first time, you may have to move and set up closer). Never call much, if any, while the gobbler is on the roost. If he is close, just wait him out. If he stays in the tree until it is good light, and especially if he is close enough such that he might see your decoys, you might give him a single short series of soft yelps, but never get into a calling match with him or the hens he might have on the roost. If he has hens, and even if they are very vocal on the roost, don't get tempted to call back to them a bunch. They will only get suspicious and be less likely to approach once they hit the ground. When they start coming out of the trees, that is the time to begin to call a bit more. If the gobbler hits the ground first, try to get his attention with some soft yelping. If you have decoys out, you want him to either notice them right off, or if he is some distance away, you ideally would like to entice him toward you with some calling to get him within sight of the decoys. If you don't use decoys, you want him to come searching for you. If and when you get him interested and headed your way, it is usually best to be very conservative with your calling. However, there is a fine balance between keeping a gobbler interested and having him lose interest, especially if he has hens with him. And if he has hens, there is a fine balance between keeping their interest, as well, or causing them to become suspicious and move away, taking the gobbler with them. A general calling rule I use is that if they are coming, I stay conservative with my calling,...just enough to keep them moving in the right direction if they start to get off-line. If they move away, I will get more aggressive to see if that changes their attitude and gets them turned back toward me. The biggest no-no of hunting birds on the roost is getting busted at some point. Birds that bust you off the roost site will invariably be harder to call in the next time. Never take chances that will get you busted close to the roost. If you don't get busted, you can adjust your set-up tomorrow based on what the birds did today. Get busted and they will likely avoid you and your calling efforts like the plague every day you hunt them. thanks for the advice i wasn't able to make it this morning i had to work over lastnight. but im going in the morning for sure. i can see why turkey hunting is such a addictive sport. If you plan on hunting public land----plan on parking BEFORE any veteran . Up here in New York on opening day this May 1st---I know that most turkey hunters will start pulling in around 3.55am. It will continue like this to near 4.30am!! Using this as an example-----get to a hot parking area no later then 3.45am and get your stuff out and be ready to start your walk in when you see (headlights) turning in to your parking area! If you have a mountain bike---get that ready. You may not know as much as the veteran turkey hunters pulling in--but you are there 1st! Get in quick!! General Nathan Bedford Forrest---Confederate Calvary General said it best---- GET THERE THE FIRSTIST WITH THE MOSTIST!! Get to your field first and set-up! quavers16 wrote: If you plan on hunting public land----plan on parking BEFORE any veteran . Up here in New York on opening day this May 1st---I know that most turkey hunters will start pulling in around 3.55am. It will continue like this to near 4.30am!! Using this as an example-----get to a hot parking area no later then 3.45am and get your stuff out and be ready to start your walk in when you see (headlights) turning in to your parking area! If you have a mountain bike---get that ready. You may not know as much as the veteran turkey hunters pulling in--but you are there 1st! Get in quick!! This post is 100% accurate, but I will add this: Always have Plan B. Just because you are first in the morning to arrive in that parking spot doesn't mean the next guy pulling in will be considerate of your promptness. Example - last spring I hunted a small WMA of about 1,500 acres with only 4 access points. I was there at 3:45am. I got out, went to put my boots on and another guy pulled in, stopped when he saw me, then pulled in and parked. He literally ran past me standing in my untied boots to get to the trail head first. Literally - he ran. No more than 30 seconds later as I was uncasing my gun, a second vehicle turned in, and because the pull off was so small they wedged their F150 in so it would fit. Two guys jumped out, and the driver says to me in the dark "Lots of ground up there!" Without another word they too ran up the trail. So, I executed Plan B. I left; not the kind of people I choose to share the public woods with if I can help it. That WMA borders private ground on three sides, and a river, and necks down to a pinch point about a 1/2 mile back. Not enough ground for four guys going three directions. Turkey hunting is at times, particularly early in the season, full of inconsiderate people. The "Golden Rule" doesn't always get applied. So have Plan B in your pocket to accommodate those guys who are so focused on the kill that their behavior becomes reprehensible. The one ive been hearing in the last couple weeks has not gobbled or anything the last couple days. I havent been calling hardly any. Ive waited for 4 hours id call maybe 4 times. Ive heard nothing not even a hen yelp. Maybe try some different types of calls and maybe different cadences on those calls. The biggest thing is to try locate the bird first with your locator calls. After you know roughly where he is at then you have something to work with. Im waiting on calls from david hollaran to come in. I got got him to coming with a primos box call this weekend. I didnt much. But he was goobling very often. 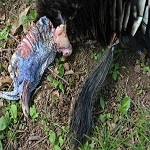 Learn how to make the turkey hunt you. One more for you. I hunt some big timber country in the Ozarks where there can be miles of uninterrupted forest. It's not uncommon to have a gobbler hung up on a small secondary ridge that you can't make it to without being seen. After figuring out that he's not going to come your way quit calling long enough for him to move down the ridge (confirmed by his gobbling) and quickly move to where he was strutting and gobbling. I have killed many toms using that technique. First, I would say, find a mentor or someone with experience to work with you. Second, learn one or two basic calls and have confidence. Third, understand and learn woodsmanship. Finally, if at all possible know the area you are planning to hunt.